The town has been politically divided into five wards for easy administration, namely, OwaIye, Ejibo, Ilaroo and OdoAlu (Stranger quarters) like in other Yoruba towns judicial as well as political administration start from the primary household setting or family compound wherein the headman in the family (the oldest man) see to the smooth running of the affairs of his household. He has to settle disputes within the family and enliven the family members helping also to enforce the policies of the king that household. Matters that the headman in the family (baale) could not control had to be directed to the headman of the particular wards (baale) for clearance especially disputes between members of the two different wards. Falling to settle such disputes, the matter would then be referred to the highest authority in the land the king whose title is Atah who would then pass the final judgment. There is also a rite whereby one who commits backsliding, witchcraft or an offence against the town would be made to swear his innocence at “Para-Olua”. If guilty, latest by the 7th day after the false swearing, he would die or turn lunatic. This is a special swearing rite done in the name of the ancestral founders of the town. Politically, the Atah had beside him set of chiefs generally referred to as the Iwara-Mefa. They are the king makers and advisers to the kings. The constitute the great authority next to the Atah i.e. the king, these set of chiefs along with the Ogbonis head by the Oluawo perform the investiture ceremonies of kings and chiefs. This set of chiefs were strong war-lords who led the town in times of war against other towns since it could be found in the town’s oral chronicle that they pursed an expansionist program like old Oyo empire. We also have the Ipaye Chief or civil chiefs who represent the commoners. These chiefs are those who intimate the lang with the people problems and desires. They also help in interpreting and enforcing the king’s decisions and policies to the people. Nest to these, we have the set of female chief headed by the Iyalode. These set of chiefs’ help to intimate the king with the problems and desires of women folks, thus aiding and abetting the execution of the political affairs of the town. It also have to be noted that these set of female chiefs have a say in the dispensation of justice on matters affecting woman folks in the town. However, this titles has gone to oblivion since there are no more female chiefs but leaders whose titles are Iyaloja or in some cases they are called Iyalode. Another set of chief who play significant role in the political/administration of the town are the religious chiefs headed by the Oluode. In critical times the importance of these set of chiefs come to the force. For instance, at such time like the coming of external aggressors, times of pestilence, festivals, choice of kings, chieftaincy candidates as well as during coronation and chieftaincy ceremonies. These set of chiefs are followed by the representatives of each of the five political wards who are not chiefs but headman of each of the political wards (Baale). These people represent their people’s interest in the king’s court thus helping to intimate the king with the ward’s problem and desire, to argue out some of the kings policies different from but perform the same duty as the Odofin. It is not easy to forget mentioning the king’s going man who carried about a metallic substance with hallow cavity which he beats to make important announcement and decisions by the king especially these bearing some urgency to the town’s people without him, this shift communication link needed at such times could have led to confusion or even terrible disasters. Socio-economically, there is the age-group setting wherein, the elder have been exempted from certain jobs and solely given positions of authority dispensation of justice and central of social affairs. The middle-aged were those who really contributed in terms of physical exertion toward the socio-economic development of the town. They supply from feeds, organize themselves to do public duties towards the socio-economic development of the town such as construction of roads or place. The modern hall building of Ayede is a case in point. The young ones who have not reached puberty helped the mothers to harvest and carry harvester products of the man’s farm land to the market after taking the required amount for domestic need. The proceeds from such sales are then given back to the husband, with which he manages the affairs of the family and his other social and external obligations. The important role of the woman in the domestic set up is the home and kitchen management. She also exhibits hospitality, cheer and charity to relatives and visitors. In the defense of the town, it is the middle age men who also went to war to defend the town against external aggressors. An attempt at pinning some of the functions of the organs involved in the administration of the town to certain occasions and personalities has not been so successful. But that events have really happened where in the various functions had been executed is rather indisputable. 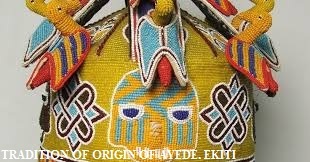 One would have observed that the administrative organs of Ayede not unlike that of other Yoruba are closely related. The system have also made provision for chiefs to “disobey” or “defy” the king “enmasse”thus signify their disagreement with an Atah’s the king decision, policy or show of high handedness, thus establishing a system of check and balance to check the excesses of a very powerful “Atah” (the king). The fact that women were involved in the administration would disprove the thought that they were probably regarded as second class citizens there says were usually grated special consideration. This would also seen to vindicate the belief that behind every successful man, there is a nice women since women tend to be more rational and less rash in their ideas thus capable of reducing disastrous their gentle approach. The dependence on the deities in crucial moments such as in festivals external attach pestilence, choice of royal and chieftaincy candidates as well as swearing into office ceremonies and rituals tend to lend further weight to the assertion that Yoruba not heavenly elements and their dead ancestors on some important events of their lives. Deities like “Yemoja”, Esi-Onogogo-Babatigbo” and Iyalori” are of relevance here. If one tries to draw parallel line between the situation describe and what it is now, it is now, it is after the advent of western civilization, one would note that a lot of the functions of the enumerated administrative organs had been eroded by new values. We not more have internecine war as it was before, hence the role of the war chiefs had been depleted by obsolescence. Likewise, the world no more believe strongly in the office of the religion chiefs now bears less significance when compared to its former status. A lot more had happened to deplete the roles of the administrative organs continually as we do more and more adopt the alien system of government. Worse of all is the fact that the power of kings has now been greatly eroded by states and local government officials. According to the Atah of Ayede recently, he said the traditional rulers now merely reigns as opposed to former times when they ruled with great powers of life and death. They now merely interpret and enforce state government policies among their people. They are no longer the most supreme policy making organ for their peoples but are rather simply representatives of their people to the state and local government.